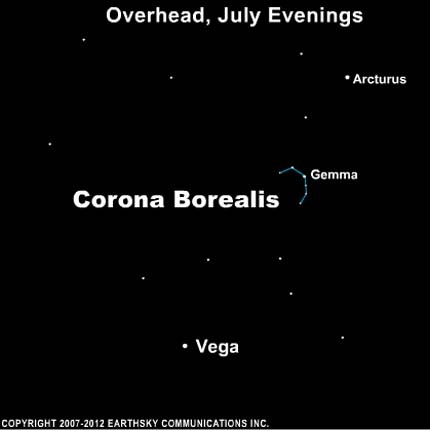 To see what is shown on today’s chart, you would face east and look high overhead for Corona Borealis, also known as the Northern Crown. This constellation looks like a half-circle, in the middle of which is a white jewel of a star called Gemma. The Crown is located more or less along a line between two bright stars: Arcturus in the constellation Bootes the Herdsman and Vega in the constellation Lyra the Harp. Arcturus has already passed its highest point in the evening at this time of year and is slowly descending to the west. Vega is still high in the east on July evenings. With dark skies, you will notice the reddish color of Arcturus, and Vega’s bright blue-white tinge. Corona Borealis can be found between these two stars, but you will need a dark sky to see the faint semi-circle of stars composing this constellation. The meaning of the Latin star name Gemma should be obvious. This star is the gem of the Northern Crown. However, the star is also sometimes called Alphecca, from an Arabic phrase meaning the bright one of the dish. Gemma, aka Alphecca, is an eclipsing binary system. It consists of a smaller sun-like star that passes in front of a brighter star every 17.4 days, as seen from our earthly vantage point. Site contents copyright © 2019 Recorder Online	except as noted. All rights reserved. | 86 queries in 2.088 seconds.